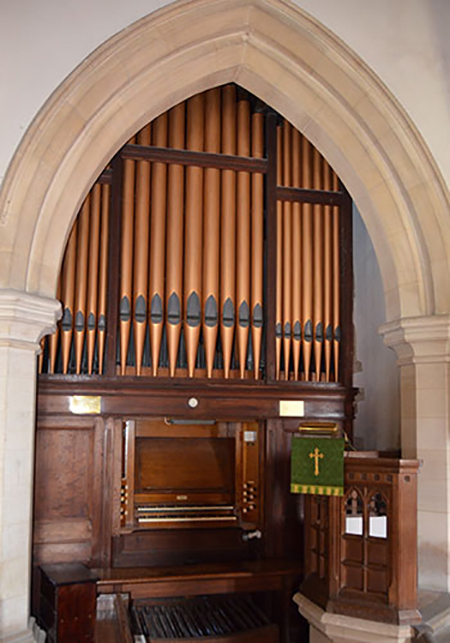 Sulgrave’s 14th Century parish church, dedicated to St James the Less, has a beautiful, late Victorian pipe organ, built by the renowned organ builder JJ Binns of Leeds in 1892 – now considered his best period. The project is not only about restoring the organ: A scholarship scheme has been planned to enable enthusiasts to learn how to play this magnificent instrument; a fund will be set up to pay an organist for our regular church services, and to maintain the organ – thus ensuring that future generations will continue to enjoy organ music in our lovely church. Stage one was to approach several reputable organ restorers to get an estimate of the cost of restoration work. Stage two is currently in progress – the fund-raising! This is both for the restoration work itself and to secure its future. We cannot start any work until we are sure we have sufficient funds – and all donations will be extremely welcome! Stage three will be when the restoration work commences and the organ is completely dismantled! It is estimated that from this time the work will take about 6 (exciting) weeks. Stage four is once the organ is fully restored and on show in all its remarkable glory – to enhance our regular worship, to hold regular musical events in the church and to offer a teaching scholarship. Click here to keep in touch with the progress of the restoration project. This entry was posted on Saturday, April 16th, 2016 at 4:02 pm	and is filed under News. You can follow any responses to this entry through the RSS 2.0 feed. You can leave a response, or trackback from your own site.